Our Phoenix AZ windshield replacement company has been providing auto glass repair services to the Phoenix metropolitan area (including Tempe, Glendale, Peoria, Scottsdale, Mesa and other surrounding cities) since 2003. We make things easy by coming to you to fix your windshield or auto glass. Our mobile service makes auto glass repair as easy and painless as possible for you. In order to get a free windshield replacement quote, simply call us up and provide the make/model and year of your vehicle and we’ll be able to instantly tell you how much it will cost as well as whether it’s covered under your insurance policy. What Can Our Phoenix Windshield Replacement Company Do For You? Our Phoenix AZ windshield replacement company can provide you with high quality, long lasting auto glass that will be guaranteed to fit your vehicle perfectly. 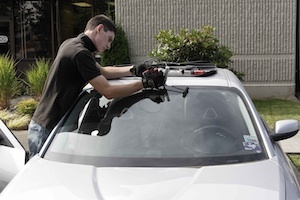 Once our glass technicians arrive at your vehicle we’ll be able to replace your windshield very carefully but quickly as well, making best use of your time as well as ours. Replacing your windshield is often a safety concern, so please don’t wait, call one of our helpful employees for a free quote. Our phone number is (602) 753-0440. Windshield replacement is our passion, and soon you’ll see why.